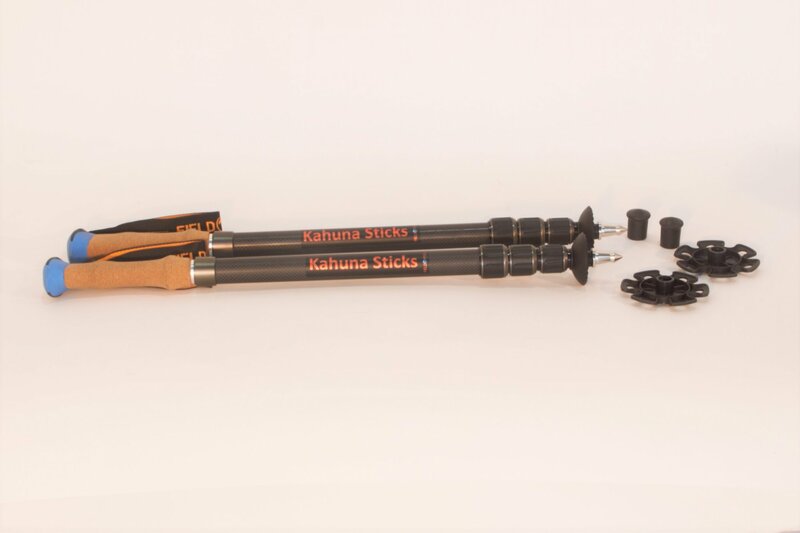 Kahuna Sticks are the strongest trekking poles in their class. Made of 26mm carbon fiber they are amazingly strong and light weight. At only 12 oz you will be amazed at how comfortable they are in your hand. The 4 adjustable segments allow the pole to adjust from 21.5" to 60.75" tall. The removable grip allows the pole to be reduced even further to 16" in length. Included are an assortment of tip options including a 2" mud basket, 3" snow basket, rubber foot or metal spike foot. The adjustable lanyard and cork grip make them ideal for hiking up or down steep terrain especially when carrying a heavy back pack.